Below is an example of how one might incorporate the indicator boards. The approach shown below is designed to provide the current equity allocation for a balanced tactical asset allocation model with a base target of 60/40 stocks/bonds. The overall intent of the model is to keep equity exposure in line with current conditions. 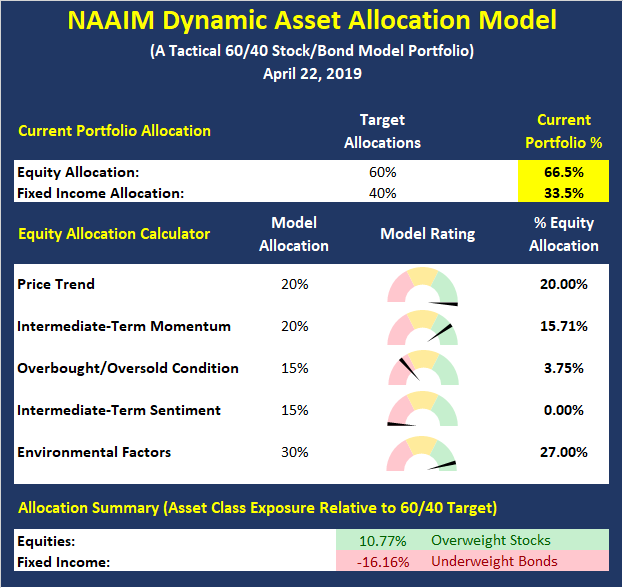 The model below is for illustrative and informational purposes only and does not in any way represent an endorsement by NAAIM or an investment recommendation. The model is merely an EXAMPLE of how indicators can be grouped to create a guide to market exposure based on the inputs from multiple indicators/models. Below are the historical equity exposure readings for the NAAIM Dynamic Asset Allocation Model. Note that the difference between the equity exposure reading and 100% is the allocation to fixed income.